"Eddie, will you stop worrying? I've known what I was doing since I was six years old." 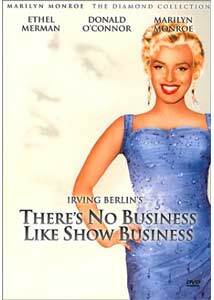 When I first got The Marilyn Monroe Diamond Collection, I decided to start with There's No Business Like Show Business because I thought I would probably enjoy it the least. My perception of it was as a big, old-timey musical in which Marilyn had a relatively small part. The story here is not the main thing and only serves as the launching point for the musical numbers. This was 20th Century Fox's answer to the dominance of MGM in the musical genre of the era and all stops were pulled to make this as big as possible—some of the big revue numbers are just eye-popping extravaganzas! The music of Irving Berlin, recycled from a plenitude of other films, is the heart of the film and makes for great nostalgia of a simpler America. Topping the bill is the legendary Ethel Merman—whose singing style, let's say, is a matter of taste—making somewhat of a comeback in this mid-1950s musical. Merman left Hollywood after some success in the '30s, including Alexander's Ragtime Band and Anything Goes. The pre-eminent Broadway star of her era, many parts that she originated on the stage were given to other actresses in their movie versions. Here, she is Molly Donahue, the matriarch of a somewhat clichéd Irish Vaudeville family. I particularly enjoyed the musical number where she substituted as an old sea salt for her son, Tim (Donald O'Connor), in a sailor bit singing A Sailor's Not A Sailor ('til He's Been Tatooed) with her daughter Katie (Mitzi Gaynor). Merman later sings the title song in her signature brassy style. The Five Donahues are anchored by dad Terry Donahue played by Dan Dailey, who gives a solid performance in a role that he knew well. Dailey came up through Vaudeville and Broadway and he is that certain type of mugging actor that was popular in those years. He probably has the only dramatic moments that really work in the movie. Since this film has been release as part of The Marilyn Monroe Diamond Collection, Marilyn's performance deserves special attention. However, she falls victim to the weak, offstage story with really only a few brief scenes. There is not much time to establish a character and her acting seems somewhat undeveloped, especially when playing with O'Connor. But, like the movie as a whole, she comes alive in the musical numbers and these are classics. Her performance of After You Get What You Want, You Don't Want It sizzles despite some clunky choreography. The production number of Heat Wave is delicious and earns this film its place in the Diamond Collection. Her other number in rehearsal for the big show, Lazy, is pleasant and humorous with O'Connor and Gaynor's contributions. But, Marilyn almost disappears from the latter part of the movie and it makes it obvious that her part was beefed up to take advantage of her rising fame. This made me wonder if Merman felt similarly about Marilyn as her character Molly feels about Vicky. All in all, this is a fun romp with great musical numbers and is certainly worth watching to get a sense of a type of variety entertainment that has all but disappeared in our era. The performers are attractive, talented and really know how to "sell a song." Image Transfer Review: The Restoration Comparison gives a nice glimpse into what it took to transfer this 47-year-old film. The notes indicate that There's No Business Like Show Business was the least difficult restoration/transfer job of the films in The Diamond Collection. The anamorphic presentation here is beautiful, with saturated colors that pop off the screen like few movies I have ever seen on DVD. Although I noticed a few flaws when displaying complex patterns, there were very few. This movie is an exemplar of Cinemascope and is simply stunning visually. This DVD will go on the list of discs good for displaying the quality of your system. Audio Transfer Review: The Dolby 4.0 Stereo is very subtly mixed and gives the stage numbers an excellent punch that really opens up the sound and complements the visuals to give a real sensation of seeing a big show. Obvious care was taken in the front speakers to deparate dialogue and duet singing parts. There was some balancing disparity but not obnoxiously so. The regular stereo performed better on those parts but the fullness of sound was not as great. Extras Review: A mixed bag of minor extras are included on this disc. The one sheet is a picture of a poster for There's No Business Like Show Business. In addition to two trailers in English, we see a trailer for the movie in Portuguese. The title in Portuguese is O Munda Da Fantasia. There is a very interesting Restoration Comparison that allows even the most jaded DVD reviewer to appreciate the restoration work done on the films in the collection. Lastly, there are trailers for other movies in The Diamond Collection. Not a major Marilyn Monroe performance, but a memorable musical one. Add in some talented co-stars like Donald O'Connor, Ethel Merman and Mitzi Gaynor, a healthy serving of classic Irving Berlin songs, stir vigorously into a gorgeous widescreen Cinemascope presentation and one can only say, "Let's put on a show!"